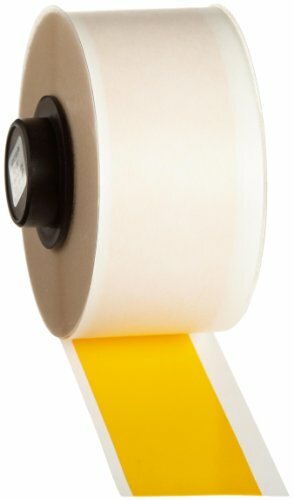 Brady 42104 Yellow repositionable vinyl HandiMark Tape. Brady B-581 indoor/outdoor marking film is a high gloss, durable, flexible, pressure sensitive adhesive product, designed for use in cartridge form with the labelizer plus printer, versaprinter label and sign maker system, and the HandiMark portable label maker, and the GlobalMark industrial label maker. Adhesive Type is Repositionable pressure sensitive acrylic. Substrate Type is Vinyl film. Standard Material Colors are White and yellow. Standard Legend Colors are Black, white, red, blue, green, and magenta. Adhesive Properties are Adhesion to Steel (PSTC-101), 15 Minute Dwell (Avg.) - 16 ounce/inch, Ultimate Dwell (72 hours) (Avg.) - 30 ounce/inch, Tack (ASTM D 2979) (Avg.) - 515 gram, Drop Shear (PSTC-7) (Avg.) 14 hours. Abrasion Resistance (Method 5306 of U.S. Federal Test Method Std. No. 191A) is CS-10 wheels, 250 gram wts., The printed legend withstands up to 100 cycles, Substrate withstands up to 8000 cycles. Material is Repositional Vinyl Film. Size is 50' length, 1" width, Yellow Color.